All surfaces should be clean, dry, sound and free from contaminants. Existing painted surfaces should be cleaned, degreased and sanded to ensure an adequate "key" is produced. Remove all loose, flaking material and treat bare areas as new substrate then prepare accordingly. As dictated by normal good painting practice. In confined spaces, provide adequate ventilation during application and drying. Do not paint when temperature will be at or below 7 °C during the painting and drying process. Preceding Coat: Apply a coat of Coo-Var Tennis Court and Drive Paint thinned 10% with clean water on porous surfaces otherwise apply direct. We're not entirely sure what you are alluding to regarding safety but Coo-Var Tennis Court & Drive Paint or Coo-Var Anti-Slip Acrylic Floor Paint are both water based and both suitable for exterior application to tarmac. Coo-Var Tennis Court & Drive Paint would be ideal for this application. All surfaces should be clean, dry, sound and free from contaminants. Apply a coat of Coo-Var Tennis Court and Drive Paint thinned 10% with clean water on porous surfaces otherwise apply direct. I am looking to paint one of my pub trade gardens which is tarmac Adam with a green non slip hard wearing paint can you recommend a product? 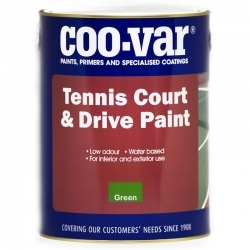 Assuming the area receives only foot traffic and the existing coating is sound and well adhered, after preparation Coo-Var Tennis Court & Drive Paint should be ideally suited. 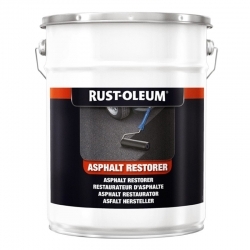 Rust-Oleum Floor Paint Epoxy Ester Grade is based on a single pack floor paint formulation but the polyurethane base has been reinforced with epoxy ester which improves durability and adhesion. Click here for other epoxy floor paints. 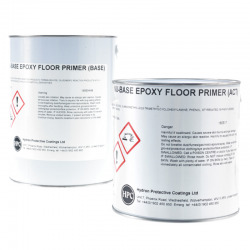 Cromadex FP2 Two Pack Epoxy Maintenance Finish is a two pack epoxy floor paint for use in the factory maintenance and refurbishment environment. The product has excellent chemical resistance allowing it to be used in more aggressive environments. Available in a wide range of colours and gloss levels, including BS, RAL all in a lead free finish. Smartkote Protectakote UVR Smooth is a tough, aliphatic polyurethane coating, which forms a colour-fast, abrasion and weather resistant film. 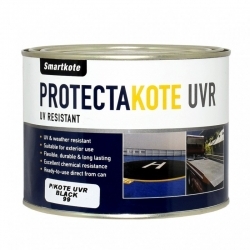 Protectakote UVR Smooth is single component, ready to use and easy to apply. 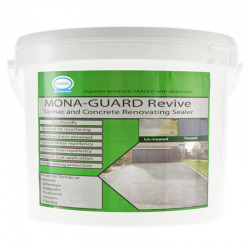 It can be used as a protective coating for many industrial and marine maintenance and new installations on exterior and interior surfaces. A quick drying, single pack, water based acrylic floor paint for foot traffic and occasional vehicle use. Can be used inside and outside on asphalt, tarmac, concrete and wood. Cromadex FP1 One Pack Maintenance Finish is a one pack air drying floor paint for use in the factory maintenance and refurbishment environment. The product can be applied easily by brush or roller. 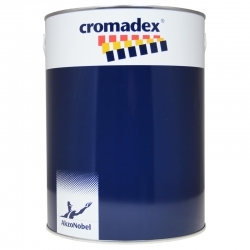 Cromadex FP1 One Pack Maintenance Finish is available in the full Cromadex range of colours and gloss levels, including BS & RAL all in a lead free finish. 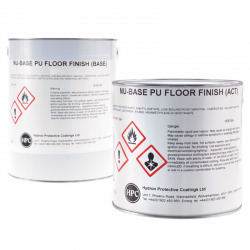 Nu-Base PU Floor Finish has the power to withstand tough applications, where temperatures may reach 150°C, or where chemicals may be present. Advantages Excellent for industrial flooring. Two pack solvent-based. FeRFA Class Type 2. 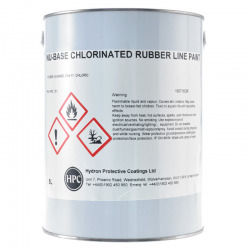 Excellent for industrial flooring.